There is a moment on the walk that feels like passing through a door. On one side the vegetation is the familiar Tasmanian mix: open eucalypt forest with pandani, tea tree and bauera, interspersed with buttongrass. It is wet forest certainly, though not rainforest. On the other side of the door - to me marked by a couple of extravagantly tall guardian pandani - everything changes. 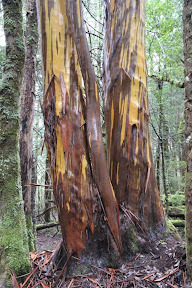 Eucalypts suddenly become scarce, replaced by King Billy and celery top pine, myrtle beech and sassafras. The light turns softer, duller, greener. Sounds grow muted. We have unmistakably entered rainforest. Pyramidal sassafras trees glow bright green, their toothed, glossy leaves, mirroring what light does break through. Above them mature myrtle beech trees dominate the canopy. Their individual leaves are small and inconspicuous; their compound effect lends an emerald tint to the whole forest. King Billy pines add vast vertical scale to the forest, deeply-fissured trunks thrusting high into the canopy, while their leaves, dark green on living branches, rusty-coloured on the forest floor, extend the green-brown colour spectrum. The spectrum doesn't end at the leaves. 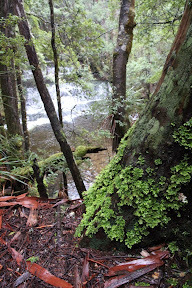 The forest floor too is covered in mosses; trunks and branches wear luminous lichens, each species a subtly different shade of green. These, it seems to me, are the colours of Gondwana. 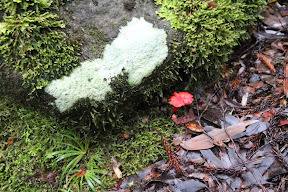 The old super-continent may be long gone, but here on the approach to Tasmania's Pine Valley, we get a glimpse of the kind of vegetation that once thrived there. 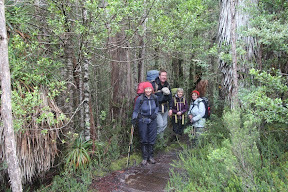 We are less than an hour from the Pine Valley hut. The six of us are aiming to reach it early on Friday afternoon, ahead of any long-weekend rush. That at least is the plan. On many walks the last hour drags, but not on this one. This forest promotes calm, asks you to pay attention, to be present to its towering, ever-changing beauty. As the track sidles through the forest, at times it moves closer to Cephissus Creek, where flooding and inundation keep the forest at bay. At such margins eucalypts take their chance, pushing into the rainforest. Further up slope, deeper into the forest, they wouldn't survive, having insufficient light to germinate, grow tall and seed. There the dinosaur trees of Gondwana are still dominant. But here at the edges the eucalypts seem part of the rainforest, draped in lichen and buttressed as though to camouflage their presence. They are the trees of the future. As old Gondwana retreats before the drying, warming climate, fire and drought-tolerant trees such as eucalypts will take over. The yellow alpine gums here might be the frontline of such change, 'though on this cool, damp afternoon they seem in no haste. We get to Pine Valley in time for a late lunch. The hut is a structure that would have suited a Gondwanan forest. It was certainly not built to take advantage of either views or sunshine. We quickly light the coal-burning heater to add an hospitable air to the chill. The next day we climb higher through the forest and into the alpine zone of The Labyrinth. Parts of the television documentary Walking With Dinosaurs were filmed here. It was one of the few places they could find in Australia that had expansive landscapes without obvious stands of eucalypts, plants that had not developed by the dinosaur era. It turns out to be one of those days on which you find yourself telling first-timers "of course on a clear day, you'd be looking at stunning mountains like Geryon and The Acropolis." Still to me, even in wet and cool conditions, it is always worth visiting The Labyrinth. And the newcomers seem content to be wandering in dinosaur territory too, and to be descending at day's end through more glorious Gondwanan forest, back to the hut. Once back we are a little surprised to find that a party of 12 young walkers has arrived to celebrate the 33rd birthday of their "older" friend. It is, literally, a walking party. But if we "crusty" walkers, all in our 50s or above, fear a sleepless night of drunken, thoughtless revelry from the younger group, we are in for a pleasant surprise. They turn out to be one of the most friendly and caring groups we've ever encountered while walking. We are included in their hilarious party games; given a taste of the birthday cake; brought into conversations, and generally made to feel anything but dinosaurs. These are the walkers of the future, fit, keen, adventurous, caring. If in comparison we feel somewhat Gondwanan, it seems there is still time and space for all of us.